Andreas Falke was born in 1952. He studied social sciences and American studies in Göttingen, Miami, USA, and St. Louis, USA. He completed his doctoral degree and habilitation in political science at the University of Göttingen. Professor Falke has spent time conducting research in the USA as a Thyssen fellow at the Library of Congress, a visiting fellow at the Brookings Institution (Washington D.C.) and a Kennedy memorial fellow at Harvard University. He was a principal economic specialist at the American embassy in Bonn and Berlin from 1992 to 2002. He has been Chair of International Studies (Anglo-American Societies) since 2002. 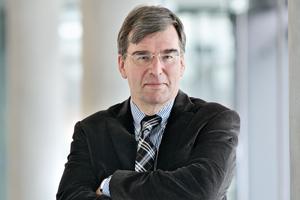 Professor Falke has been director of the German-American Institute in Nuremberg since 2004. He is a member of the advisory and editorial boards at the German Association for American Studies (DGfA). Since 2015 he is also a member of the board of the Foundation Bavarian America House Munich and member of the Bavarian America Academy. His research priorities are American politics and economy, trade and environmental policy in the USA, transatlantic economic relations, and the relationships between the USA and the BRIC countries, particularly China and India.